Hi ladies! Just some quick swatches today of the original a-england Holy Grail which I hauled a little while ago. I saw lovely Sam's re-swatch of it and I just had to get it!! It is a STUNNING gold but unfortunately I don't think it works with my skintone. Nonetheless I shall be rocking it anyway because that's just how I roll HAHA. There's a new version of Holy Grail out now and I think I might need that too.. Details: You can rab this version of Holy Grail for a limited time for £5 with free shipping! 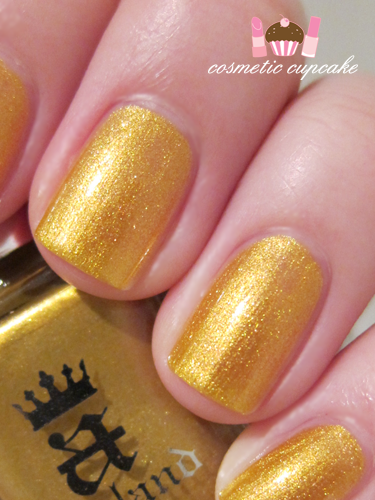 You can purchase a-england polishes from a-england.co.uk. This is my second a-england polish and I seriously need more in my collection! Have you tried any of Adina's lovely polishes? Thanks for looking as always! Glad you like it Natalie! Thanks Mel =) I just don't think it works with my skintone. Too much yellow in the shade! I think it does suit your skin tone. My pictures make the colour look better on me that in real life seriously! Hmmmm I think maybe the shimmer looks a lot more prominent on the nail than in the bottle..?